The Alzheimer Society of Ireland is the leading dementia specific service provider in Ireland.The society works across the country in the heart of local communities providing dementia specific services and supports and advocating for the rights and needs of all people living with dementia and their carers. 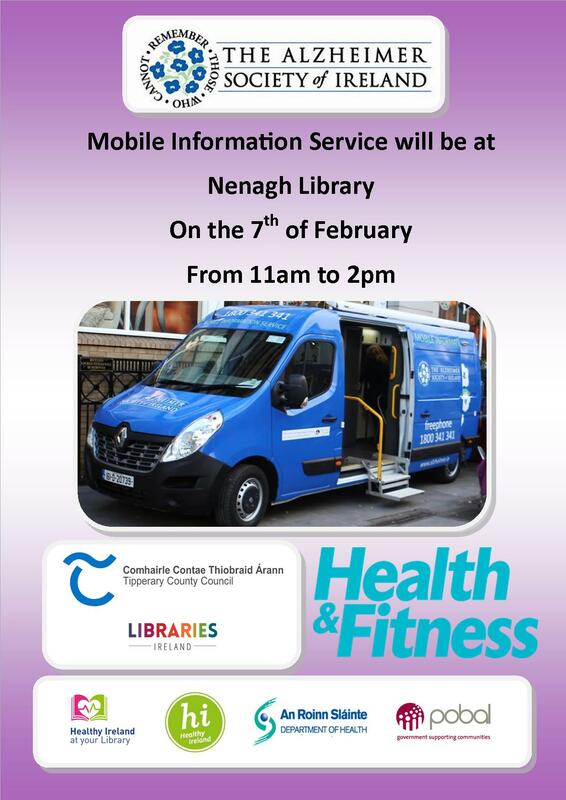 On the 7th of February the Mobile Information Service will visit Nenagh Library from 11 am to 2 pm. All are welcome to come and visit the mobile unit that will will be staffed by our local branch and they will provide information, support and answer any questions you may have. We look forward to seeing you. This is a Healthy Ireland Event and it is free of charge. The Healthy Ireland at Your Library programme includes a special books collection, online health resources and talks, discussions and workshops with a focus on physical health, mental health and health literacy.